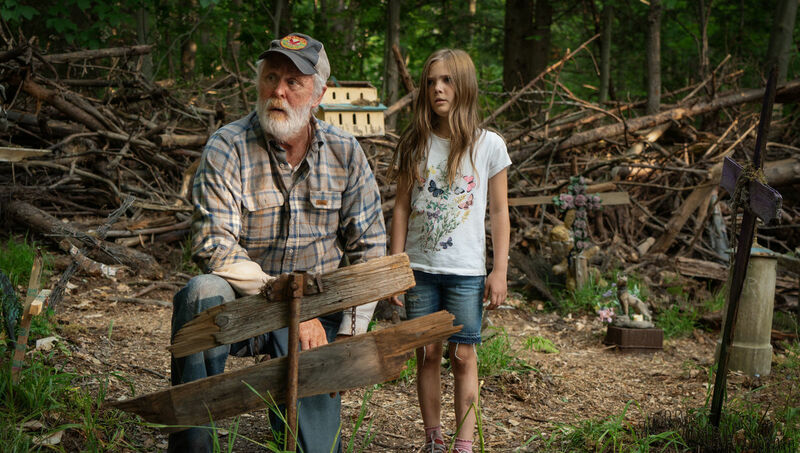 Confusion washed over me when I first saw the trailer for Kevin Kolsch and Dennis Widmyer’s Pet Sematary remake. What tone could this film possibly strike that would grant it success? The original was not a well-received film, despite being a financial success. And the trailer played the scares straight as an arrow, as if this was your standard early-year horror release. In a way, Kolsch and Widmyer’s finished product is both your standard early-year horror release and the campy, devil-may-care King adaptation that Mary Lambert produced. Because of this, the product is a fairly messy experience. Louis (Jason Clarke) and Rachel (Amy Seimetz) move their family to a rural location, so that Louis can take a less time intensive job at the medical college in order to spend more time with his young children, Ellie (Jete Laurence) and Gage (Hugo and Lucas Lavoie). Part of their 50-acre plot of land includes a stretch of forest which houses a graveyard for lost pets. Beyond that graveyard is something sinister. Something with a power. Louis is drawn to the power of this forest, and, following a tragedy, seeks to use it for his gain. The results are not what he expects. Before we get to this segment of the film, which is easily the most enjoyable, we sit through an hour and change of backstory creeping back to the characters’ present in the form of apparitions and nightmares. The first two thirds of this film are a slog, plain and simple. While there are a handful of tense scenes that utilize clever visual tricks and staging, most of it plays out like the most boilerplate of horror films. And this lengthy stretch of preamble results in a film that comes off as nondescript. What can be described of this majority chunk of the film is the acting, which is wilted, and the pacing, which is…also wilted. Clarke and Seimetz share a pair of scenes in which one comforts the other over a trauma, and neither are convincing. Neither actor is able to pull off either side of the exchange. They both comfort without empathy, and they both receive the comfort with visible tears yet no believable distress. One of these traumatic events provides some effectively grotesque imagery, but even this comes off as stagnant given the scene surrounding it. Ultimately, the film only succeeds in presenting the imagery. It does not carry out an engrossing horror film around it. Early on, we see the victim of a car crash, and this is a genuinely horrifying image to see. The makeup and effects crew should pat themselves on the back for the images that they conjure, but they should be saddened by the lackluster film that their work is encompassed by. This is not to say that Pet Sematary does not pick up the slack in the climax. Kolsch and Widmyer imbue a little camp into this final act, and the result is more lively and fun than anything that came in the hour preceding it. The majority of this camp work is carried out by Jete Laurence, who makes a real meal out of her performance in the final act. She is quite fun to watch. The film cannot bear all its weight on the final third, however. The overall experience of Pet Sematary is a lackluster one, and I would not fault someone who is too jilted by the first hour to enjoy the festivities in the second. Kolsch and Widmyer co-directed Starry Eyes, a fun and tense horror film that I would recommend to a fan of the genre. But I would approach Pet Sematary more cautiously.